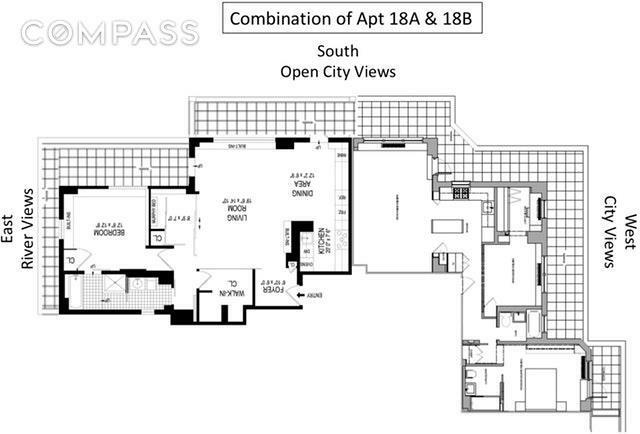 A terrace lover's dream and a once in a lifetime opportunity to purchase adjacent apartments. Both in mint condition with wondrous natural light and terraces that wrap 3 sides of the building, from east to west. This 3 bedroom, 3 bath home can be converted to add a 4th bedroom. Set high on the 18th floor with city and landmark views, including the Empire State Building and the World Trade Center.The Peter James is a full service, meticulously maintained Co-op located in Gramercy North. Amenities include 24 hour Doorman, stunning roof deck, and laundry on every other floor (including this floor), garage parking, and free bike storage. Pets are welcome!For more details, see the individual listings for Apt. 18A and 18B.